Real talk: this reporter has been waiting for this review for awhile. Not to write it necessarily, but to have the album to write it about. Impulse Control first crossed almost two years ago. I loved their live sets, but their existing recordings were thin, and sad-sounding. But on Thursday, August 18, the band finally dropped its actual debut, an 11-track collection called Welcome to the Fold. The album has thicker, more driving guitar tones than the band’s earlier recordings, accenting the pop-punk foundations of its sound. But even with the lock-tight rhythm section of John Johns on bass, and beats courtesy of the freakishly metronome-like Max Malcomb, the overall effect leans more power-pop than pop punk, largely because of the vocals of singer Tim Duryea, who, even at his loudest and most intense, comes across about as dangerous as a warm glass of milk. Or, as the band describes it, “slightly ironic, mostly loud, kinda quiet, a little awkward, fun at times.” You can hear bits of Weezer, Matthew Sweet, Phantom Planet, and Death Cab for Cutie. And there ain’t nothing wrong with any of that. The album opens with its title track, “Welcome to the Fold,” a peppy, major-key rocker about trying to balance adulthood with the teenage bliss of playing in a rock and roll band. “I’m fine with growing up, but I don’t want to grow old,” singer Tim Duryea, coos in the song’s bridge. The second track “Here I Stand,” is a slightly faster rocker, built around alternating back and forth between staccato chords and a quick palm-muted run of high notes. The album closes with “Lonely Soul Watering Hole,” a half-time strummer about the time-honored rock tradition of drinking in a dive bar. “I’ll be quite honest, this is not what I was promised,” Duryea sings. Not included are the band’s great covers of Taylor Swift and Britney Spears. 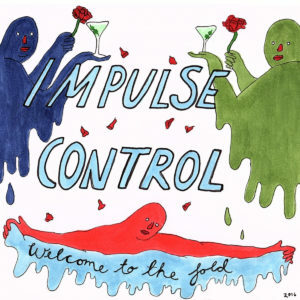 Impulse Control writes good—arguably great—songs, with solid melodies, great riffs, and clever wordplay. But the truth is they aren’t always the most charismatic band on stage, so those qualities are often—sadly—lost in the din of local dives. But on Welcome to the Fold, they shine. The songs drive, the hooks catch, and the production is really good. They’ve set a high bar for pop-rock in Southern Oregon this year. Every other band is now on notice to up their game. Welcome to the Fold is available as a paid download on Bandcamp, and on hard copies at the band’s performances.